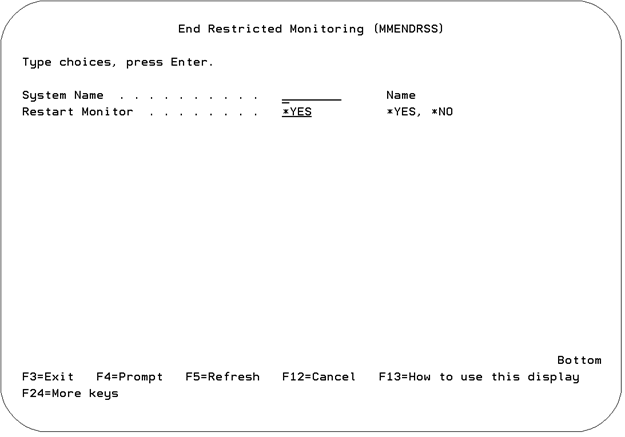 QMessage Monitor is able to continue to monitor a remote IBM i (OS/400, i5/OS) running on IBM Power Systems (System i, iSeries, AS/400), from a central system, even when the remote is in restricted state. It does this by using an advanced feature called restricted state processing. Note: Any outstanding inquiry messages on the remote system must be answered before starting. To monitor a remote machine while it is in restricted state, commands must be entered on both the remote machine and on the central machine. The commands are found on the Advanced Features Menu. The Advanced Features Menu can be called from the Main Menu by selecting option 15, Menu: Advanced Features, or by entering the command GO QMMADV. Invoked from the remote machine. Send message from the remote to the central machine, to say the remote is ready to be put into restricted state (option 5, Start Restricted State Controller; MMRSSCTL). Invoked from the central machine. Establish restricted state communication between the central and remote machine (option 1, Start Restricted Monitoring; MMSTRRSS). Invoked from the central machine. Defines the task to be performed on the remote while it is in restricted state (option 2, Queue Command to RSS Machine; MMRSSCMD). Invoked on the central machine. Provides a shortcut route to the message console. Monitor the remote machine on the central message console (option 3, View Message Monitor; MM). Invoked on the central machine. End the remote system’s restricted state (option 4, End Restricted Monitoring; MMENDRSS). The steps for the above options are detailed in the following sections. This must be done on the remote machine that is to be put in restricted state. The MMRSSCTL command starts the restricted state server. When this program is running on a remote system (for example, DSP01), restricted state monitoring and command processing is possible. It's important that the user profile running this command has adequate authority to the QSYSOPR message queue and any commands that are to be run. The user profile must have adequate authority to the STRTCP and STRTCPIFC commands, if the IP Interface to Start parameter is specified. From the Restricted State Processing Menu, select option 5, Start: Restricted State Controller; or enter the command, MMRSSCTL. 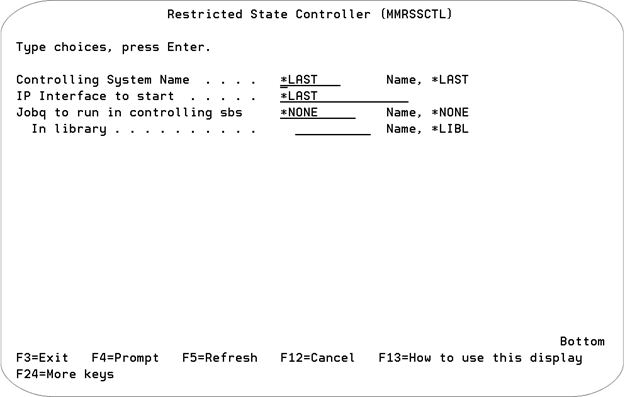 The Restricted State Controller screen is displayed. Enter the name of the system from which restricted state commands will be issued and the associated Internet address (the available interfaces can be determined using the NETSTAT command, and selecting option 1. If no interface is to be started, specify *NONE) that will be controlling the remote while it is in restricted state. Specify *LAST to use the last system to monitor the system. This server can be run in batch in the controlling subsystem. Enter the name of a job queue connected to the controlling subsystem to activate this function. Valid only for V5R3 and above. Specify *NONE from the system console to run the server interactively. The remote machine sends a message to the central system, named above, to say that the remote is ready to be put into restricted state. The Restricted State Processing Menu is displayed on the remote machine. This command has to be entered on the central machine. The MMSTRRSS command starts the Restricted State Message Monitor function. Normal monitoring is ended and only QSYSOPR is monitored from the console server job. 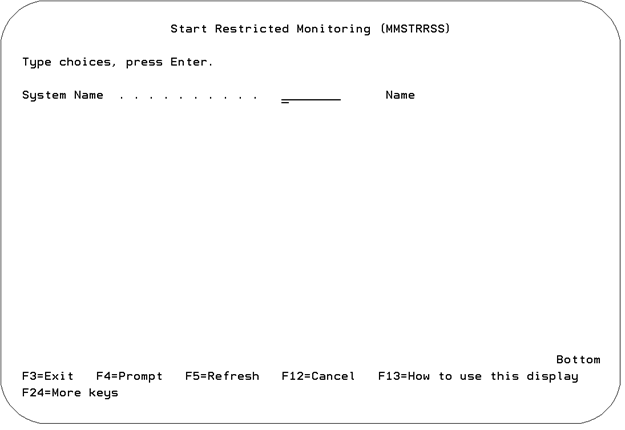 From the Restricted State Processing Menu, select option 1, Start: Restricted Monitoring, or enter the command, MMSTRRSS. The Start Restricted Monitoring screen is displayed. Enter the name of the remote system to be monitored in restricted state. The connection between the remote and central machine is established. The Restricted State Processing Menu is displayed on the central machine. All functions of the remote system can now be controlled from the central machine. The MMRSSCMD command defines the tasks to be performed on the remote machine while it is in restricted state. Commands can be queued to a system by issuing multiple commands. The central system receives messages from the remote system and can answer inquiry messages while the tasks are being performed. From the Restricted State Processing Menu, select option 2, Queue: Command to RSS Machine, or enter the command, MMRSSCMD. 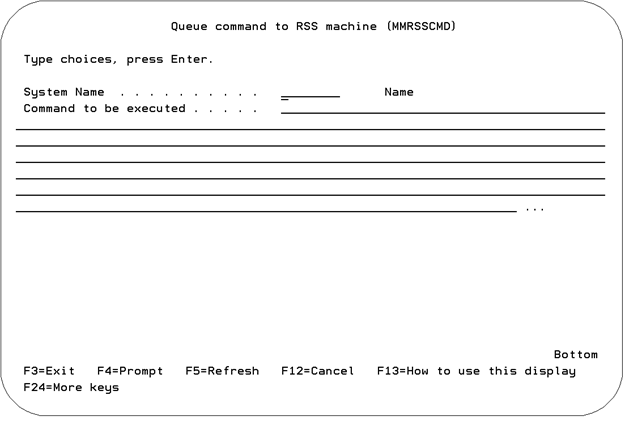 The Queue Command to RSS Machine screen is displayed. Enter the name of the system to which the command is to be sent. Enter a valid command. The command is checked for validity before being queued. The command is sent to the remote. The Restricted State Processing Menu is displayed. If you want to send more commands to the remote repeat this procedure. Note: The MMRSSCMX command can also be used to define the tasks to be performed on the remote machine while it is in restricted state. This command performs the same function as the MMRSSCMD command but does not check that the 'Command to be executed' syntax is correct. Messages from a remote in restricted state can be viewed and answered, from the central Message Console, in the same way as messages from any other system. There is a shortcut to the message console in the Restricted State Processing Menu. To use the shortcut, select option 3, Display: Message Console, or enter the command MM. The MMENDRSS command ends the Restricted State Message Monitor function. Note: It's good practice to take the system out of restricted state before issuing this command. If the command ENDSBS SBS (*ALL) OPTION (*IMMED) was entered from the central machine to put the remote in restricted state, you are strongly advised to restart the remote machine’s subsystems before restricted state monitoring is ended. To do this, queue the following command to the remote system: STRSBS QCTL. From the Restricted State Processing Menu, select option End: Restricted Monitoring, or enter the command MMENDRSS. The End Restricted Monitoring screen is displayed. Enter the remote system’s name and restart the monitor. The Restricted State Processing Menu is displayed on the central machine. When the restricted state on the remote has been canceled, the RSS controller on the remote system should also be canceled. To do this, a “System Request 2” must be performed on the remote machine.